While Okechukwu Ofili came to me with this idea, I was blown away. Not only did he agree with my belief that Nigerians do read, he took it a step further and did something. Okadabooks is a fast, simple and fun way to read ebooks in Nigeria without ever having to worry about how to pay with cash, card, whatever. 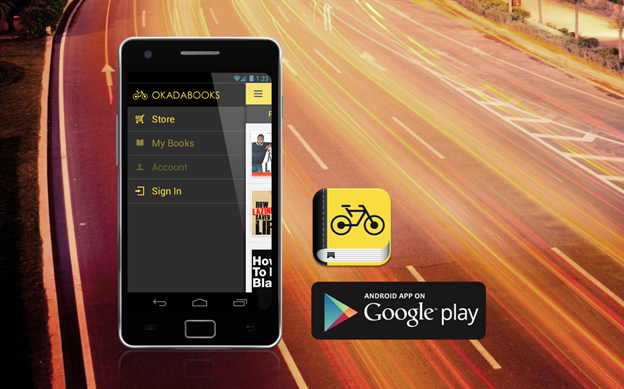 You send a text to top up your account, choose a book, then download and start reading – it’s as easy as riding an okada. It’s book reading, reinvented. Oh yeah, and it may be cheaper than the Okada you rode yesterday! The eBook reader app is currently in the test launch phase. During this time books will available to anyone in Nigeria with an android phone. You will be able to purchase the available books using your phone credit, including all the major phone providers. My short story, Best Friends Forever is on the app in full for a mere N150. There also free books, and some go for as little as N20. You are also assured of a good variety of titles and categories, and this will keep growing. We may even extend to Apple and Windows soon. To download the app, click HERE. To find out more about Okadabooks, check out their faq.